No doubt you’ve heard many times by now that french press coffee is better than standard drip coffee. I will not disagree. I used to drink drip coffee daily and over the past few years I’ve started making coffee with a french press at least a couple times every week. It requires a bit more manual work but the coffee is so much better. I truly believe the french press makes the best coffee of all the various brewing methods. Stick with me here and I’ll show you exactly how to do it so that you’ll want to put the effort in. First of all lets summarize the basic process. Here is my basic, no fluff french press brew guide. It’s short and sweet. Keep reading the rest of the page for more details and information. Basically you scoop one tablespoon of coarse grind into the press pot for every cup of coffee you plan on brewing. See this page for information of grinding coffee beans for the french press. Then you pour water from the stove that was joust boiling into the pot and cover with the plunger. After a 4 minute steep you very slowly press the plunger down until all grind is at the bottom and all coffee is at the top. At this point I advise pouring all the coffee out of the french press into a carafe to prevent over extraction. That’s basically it but there is a lot more to say about the process. Most importantly the coffee ratio which I’ll talk about next. FYI – I’m trying to make this information more accessible. I’ve setup a supplementary site for you to access this info at FrenchPressInstructions.com. That should be a lot easier for you to remember and bookmark for viewing at a later date. When brewing coffee, regardless of the method you choose, you have to use enough coffee grind relative to the volume of water you are brewing. For the french press you don’t really change the ratio of coffee to water that you would ordinarily use in a drip coffee maker. Plan on using a full tablespoon scoop for every 7-ounce cup you plan to make. If you use any more then your coffee might be a little to strong, any less and your coffee will over-extract and the bitters are the last to enter your coffee. You don’t want over extraction. Please see this post to learn more about the amount of coffee grind to use in a french press. Here is my article on the temperature of water that goes into a french press. To summarize that article you should bring your water to a boil and then pour it directly into the press pot. If the water is significantly below the boiling point then the “good” flavors of the coffee bean won’t extract from the grind properly and the flavor will suffer. This next point is important. The Correct French Press Brew Time Will Improve Taste A Lot! You’ll see on the packaging of every french press that the correct brew time is 4 minutes. Here on this site I agree, 4 minutes is bet. I’ve actually done personal cuppings where I made coffee simultaneously at 3, 4, and 5 minute steep times and tried them all. The 4-minute steep had the best taste by far. The key is that it was an obvious difference extending the time by a minute or steeping for one minute less. If you want the best flavor then you need to accurately steep for 4-min. I set the kitchen timer on my stove to get it right every time. You should do something similar to get the most out of your coffee. The recipe for perfect french press coffee is simple. It’s the way I make mine all the time although I’ll be honest, I don’t always have filtered water on hand all the time. Use pure filtered water as this has no additional flavors that tap water might contain. Use the freshest coffee grind possible. Beans that were roasted 3-6 days prior to grinding are best and beans that are ground minutes prior to brewing are the best. As for which type of coffee to choose, this is a matter of personal opinion but we do have a guide here on the site to help you. See this post on choosing the right type of coffee for french press to hear my take. Get the coffee grind to water ratio right. Use water as close to boiling as possible. Steep for 4 minutes before pressing. Pour all coffee out of the press pot directly into a carafe to prevent over-extraction of the grind. So that’s how to make french press coffee at home just as good as any professional might but this might get you thinking: is french press really worth it? Why is it any better than regular drip coffee? Let me preface this by saying I make drip coffee all the time. I’m not that much of a snob. I’ll even buy it at gas stations! But even though I’m not a snob I still think french press is worth making at least on occasion because it’s so much better. Why is french press better than drip coffee? It’s because of the oils and the brewing temperature. Drip coffee almost always is brewed in a filter basket. This even rings true for alternative drip methods like pour over coffee or Chemex coffee. The paper filters trap coffee oils that would otherwise make it into your cup. These oils are aromatics and they add flavors and complexity to the coffee that you simply want in your cup. Now, some people think these coffee oils also contribute to elevated cholesterol but even that is a stretch. I think the breakfast that is served with coffee is worse for your cholesterol than the coffee itself but that is beside the point. In a press pot the oils are never filtered out because the press is a fine metal mesh that the oils pass right through. That’s why your french press coffee is has a shiny surface in your mug compared to the surface of drip coffee. When I brew french press I use an preheated and insulated french press to keep the temperature of water as high as possible for the entire 4-minute brew period. By boiling water on a stovetop I can be sure the water is as hot as possible when starting the brew and the insulated press pot maintains that temperature. With a drip coffee maker however the coffee maker’s heating element never gets the water to a full boil – it gets close but not all the way – and then the water flows through a water line which is typically plastic and then rains down in a low flow onto the coffee grind in the filter basket. Basically, by the time the water contacts the grind it’s already cooled significantly. For the flavors to extract properly the temperature needs to be above 190 and in a drip coffee maker this doesn’t happen as well. I should note a common complaint about french press coffee though. Many people dislike it because it is “grittier” than drip. The paper filter effectively makes a clean and smooth cup but the french press method tends to leave a bit of mud or coffee grind “dust” at the bottom of your cup. This is minimized by pressing slowly and using a top of the line press pot with a super fine plunger but not all people own one. When I use the basic plunger that came with my small single serve french press I just expect to not drink the last once or two of coffee I make but that does lead us to the next most obvious question. What french press is best at making a clean cup of coffee? What is the Best French Press Coffee Maker and is it Worth It? So the answer to this is slightly complex. There are really popular french presses which are bestsellers but they aren’t necessarily the best you could possibly buy. There are also really good units that are really expensive so they might not be the best value for your money. 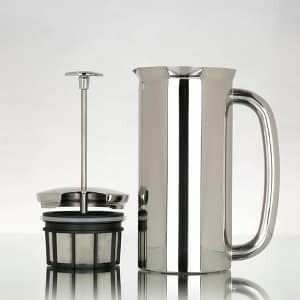 I don’t have a huge list of french press coffee maker reviews to tap on this site but I can tell you that the best possible french press would be a model made of only stainless steel and glass. It would have a two-ply ultra fine mesh plunger, and it would be insulated to prevent heat loss during the brewing process. Does a press pot like this exist? The Espro Vaccum insulated press pot has an exception filter plunger which leaves almost no sediment in your cup at all. It is extraordinary. Although it is insulated and has a ultra fine double filter their is a pinch of plastic holding the filter together. It’s also not insulated on the top of the plunger. Nevertheless I think it’s as good as they come. The Frieling Double Wall Stainless Steel French Press is the main alternative to the Espro because it is an insulated press pot that uses a dual screen filter to capture more of the sediment. This unit is probably better than the Espro at retaining heat and it is completely made of stainless steel but even though it uses a double mesh filter screen it is not as good as the Espro at eliminating grit. It’s way better than the average press pot but not perfect. If you want some more options then make sure to see this page where I have collated some of the best french presses sold. Lastly, I’d like to direct you to a few common questions people have about using french press coffee pots. These are articles I’ve published on this site already so click through to see any that are of interest to you. – Can You Make Espresso With A French Press? – Can You Use A French Press To Make Tea? You can also see the french press store here on the site if you are in a shopping kind of mood. Thanks for reading and please do share this post if you found it helpful!